Nokia has soft launched its Ovi Store downloads store to handsets in Australia and around the world, providing a direct application download to several various models of the company’s handsets. The store itself is a free application download from Nokia to compatible Nokia handsets, which include the E71, E75, 5800 XpressMusic, 5310 XM and 5220 XM handsets. Nokia estimates the reach of the new Ovi store to be around 50 million mobile phone users worldwide. Those interested in installing the new Ovi client can find it in the Downloads folder on their phone's main menu. 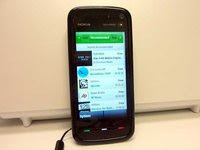 To use the store, Nokia handset owners must first create an Ovi profile at the Ovi website. When purchasing an app customers will have the choice to pay via their phone bill, or by selecting a form of credit card payment. Phone billing is available to Telstra, Vodafone, Optus and Crazy John's customers only. Nokia showed the Ovi store first at CES earlier this year, announcing that the store will be pre-installed on the upcoming Nokia N97 smartphone, expected to be released in the first half of June. The store features application downloads to Nokia handsets submitted to the store by third-party developers, but unlike Apple's App Store, Ovi also includes audio and video content, as well as ringtones and wallpapers.